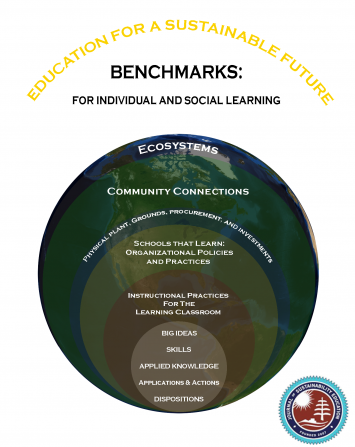 Benchmarks for Individual and Social Learning is released by The Journal of Sustainability Education and The Cloud Institute for Sustainability Education. This 70 page account is authored by, and represents the current and best thinking of, forty-two scholars and practitioners of the field of Education for Sustainability (EfS). The Benchmarks include the Big Ideas, Thinking Skills, Applied Knowledge, Dispositions, Actions, and Community Connections that define Education for Sustainability. They embody essential elements that administrators, curriculum professionals, faculty, board and community members may adopt: to align goals; to self-assess performance; and to intentionally and effectively educate for the future we want by design. In addition, the Benchmarks embody a consensus within the field to demonstrate the impact of EfS and to catalyze wide spread implementation. Following the Benchmarks, are Supporting Instructional Practices and Perspectives, Organizational Policies and Practices, and an Afterword. Several Appendices provide information about the topics often associated with EfS: contributing disciplines, aligned innovations, preliminary research findings on the impact of EfS, and a bibliography. The next step is the Call for Exemplars. We are asking educators at all levels of education to send The Journal of Sustainability Education the case examples they have of Education for Sustainability as defined by the benchmarks presented here. We want to know what EfS looks like, how educators are achieving results, and how they are communicating quality criteria at various depths of knowledge, grade levels and degrees of quality. We are inviting curriculum plans, assessment instruments, performance indicators, quality criteria and exemplary student work, and we want to know which aspect(s) of EfS the authors designed for, and which ones they achieved. We will build an open source data base of these exemplars so that the field can begin to calibrate the work for grade level appropriateness, continuity, creativity and continuous improvement.